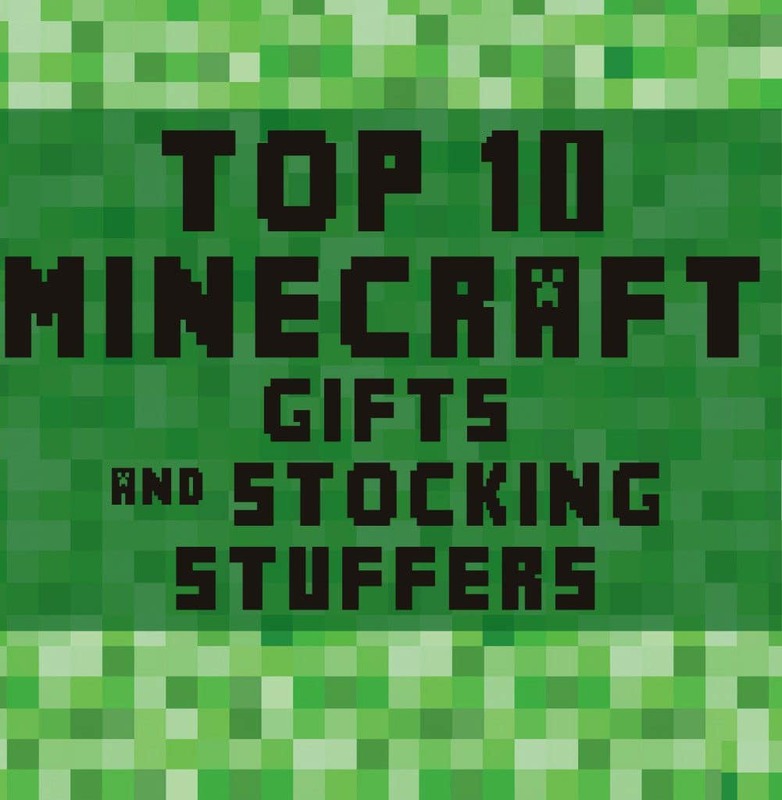 I have a Minecraft-crazy boy at my house, and I’ve pulled together the ultimate Christmas Gift Guide for Minecraft Fanatics. At our home, we don’t really “do” spooky Halloween. We do fun, dress-up, eat lots of sweets Halloween. So this year, I thought it would be fun to make a pumpkin representing each member of our family that we could bring back out year after year – in addition to carving Jack-O-Lanterns in real pumpkins, of course. 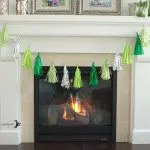 My local JoAnn’s store is moving, so they are having some crazy sales right now! That allowed me to buy these carvable foam pumpkins and supplies for a steal! 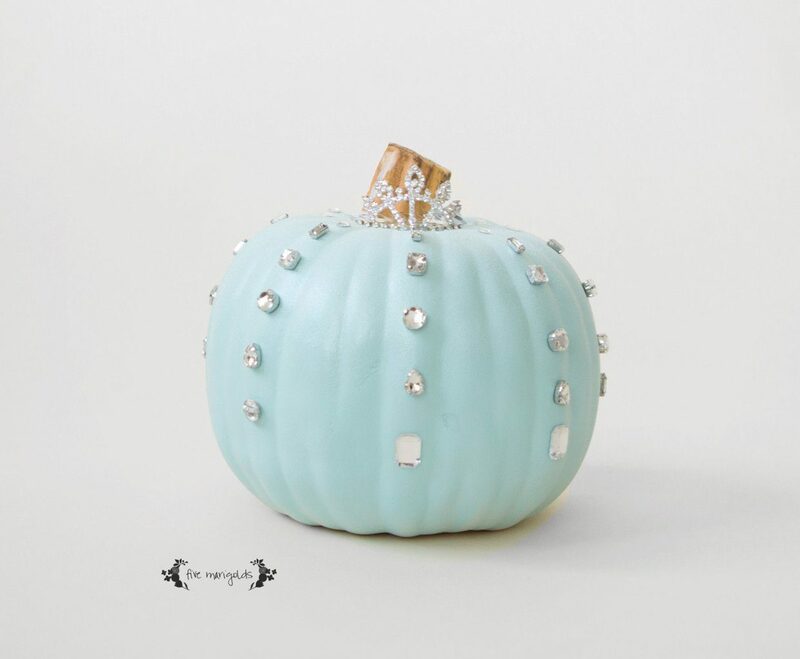 For ‘Belle, we chose to do a Frozen themed pumpkin because she’s straight-up obsessed. I didn’t have any craft snowflakes on hand, so I’m thinking it ended up a bit more Cinderella, right? Regardless, it’s perfect for this little girl who loves to dress up and play princess every. single. day. 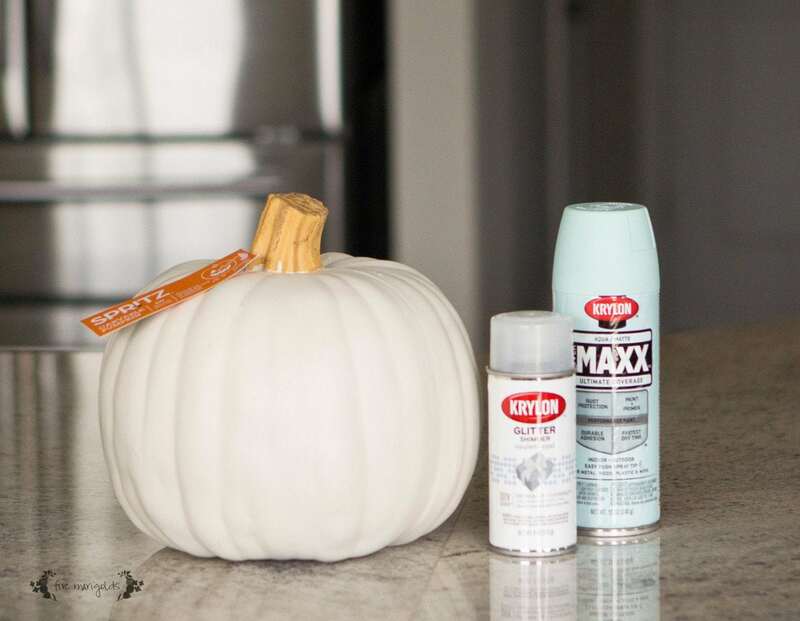 To make it, I used Krylon aqua matte spray paint to pain a white craft pumpkin. I then layered Krylon opulent opal glitter spray paint on top. I was super bummed with this though. It was gorgeous going on, but within moments it stopped working. I figured the glitter was clogging the nozzle and I tried multiple solutions to no avail. What a waste! I went back and purchased Krylon glitter blast diamond dust spray paint. It was also beautiful and the can worked much better. How pretty this would have been combined with more of the opal glitter spray! I topped it with self-stick rhinestone gems and one of the girls’ princess tiaras. For Eve, we went the Hello Kitty route. I don’t know what it is about this cat. She’s never seen a Hello Kitty cartoon, but she loves it. 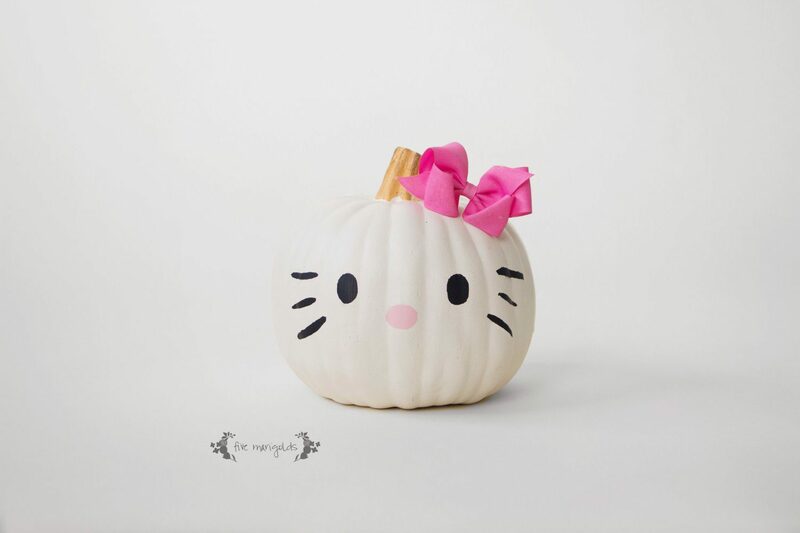 For this pumpkin, I just printed a Hello Kitty on my printer and placed it over clear contact paper to use as a stencil. Then, I simply painted the face with black and pink acrylic paint and topped with one of the girls’ hair bows. For Dub, I had to go the Minecraft route. 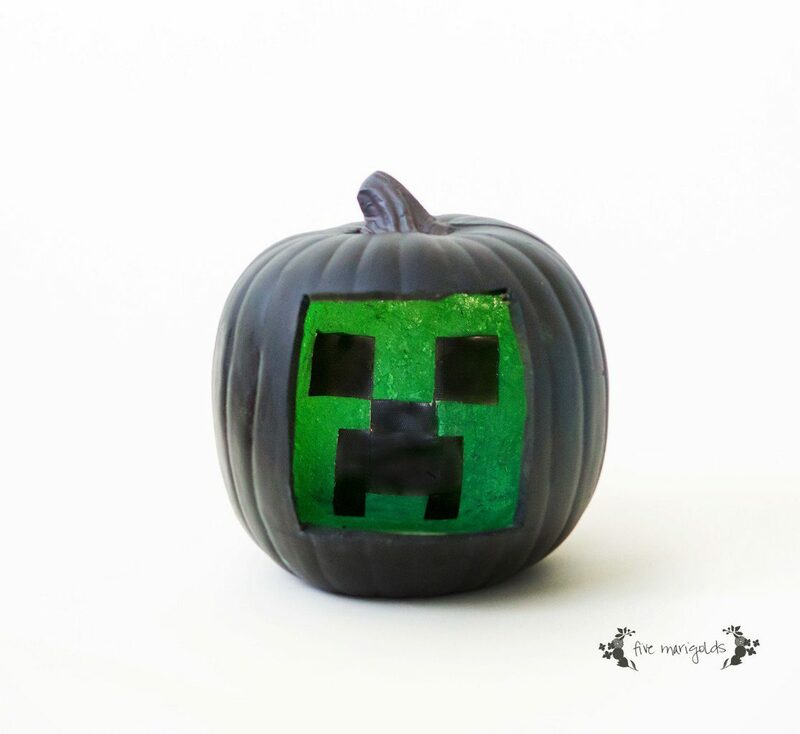 I bought a black craft pumpkin, carved out a square hole and painted the inside green with Krylon emerald green spray paint. I then printed out a Creeper face on the printer, placed it on clear contact paper and cut it out to use as a stencil. I then placed it inside the dry pumpkin and painted the Creeeper face with black acrylic paint. 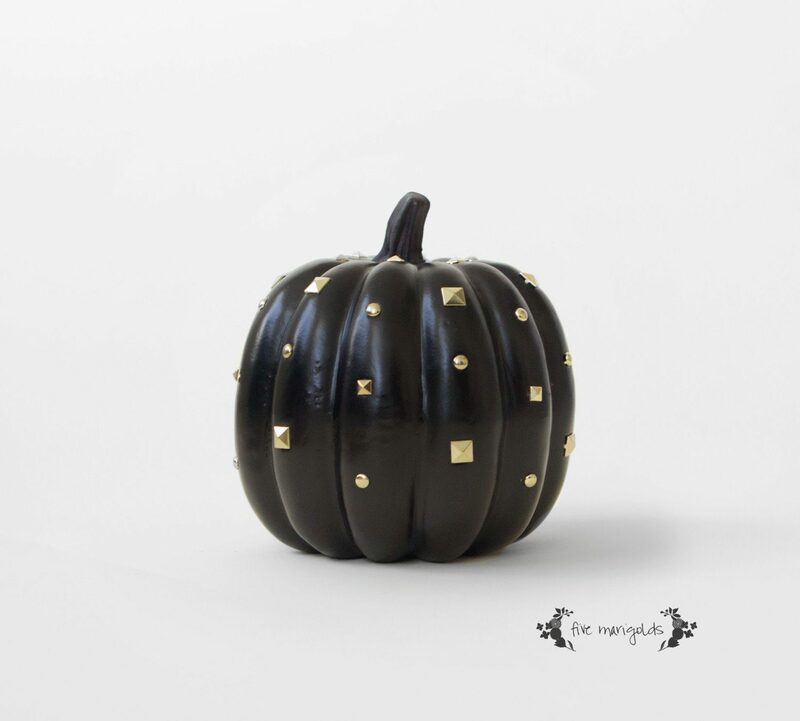 For my pumpkin, I just picked up this black studded pumpkin from JoAnn’s I just love it! He’s a long-suffering Chicago Bears fan (as am I). Da Bears! What do you think of our no-carve Family Halloween Pumpkins? 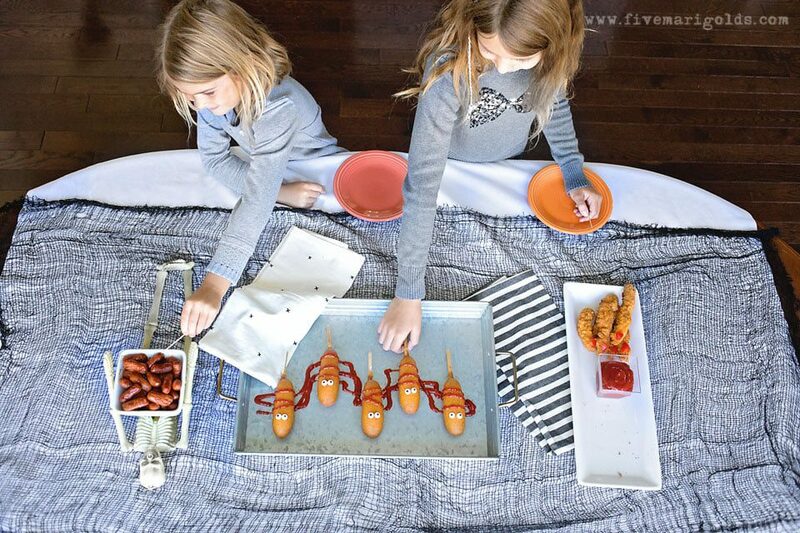 Looking for more easy Halloween ideas? 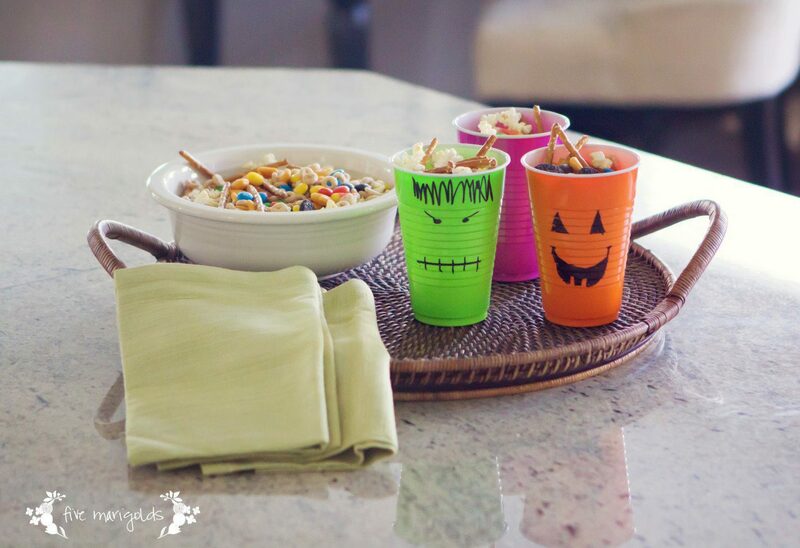 Check out my Lazy Mom’s Guide to a Halloween theme dinner. 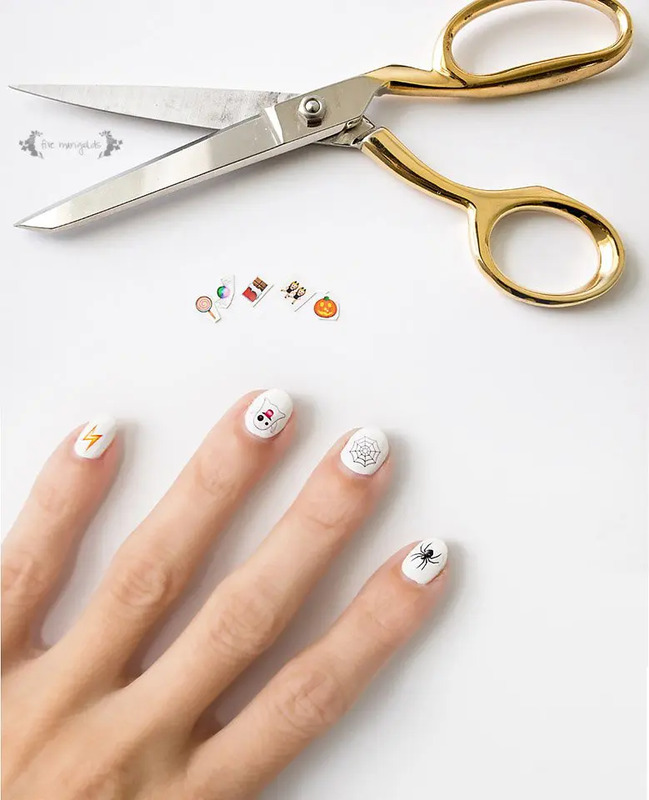 Then, check out my free printable Halloween emoji nail decals here. Halloween may not be my favorite holiday in the world, but I do love getting festive with my food! 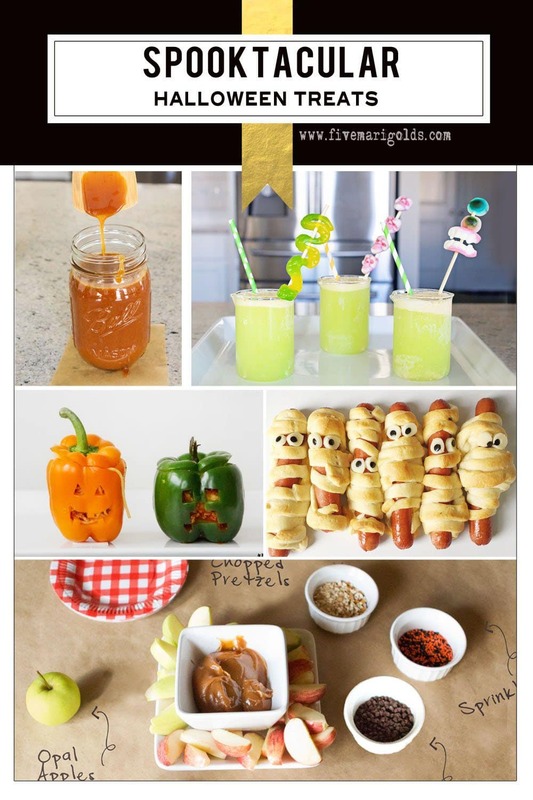 Here is a round-up of some of my Halloween treats and recipes. 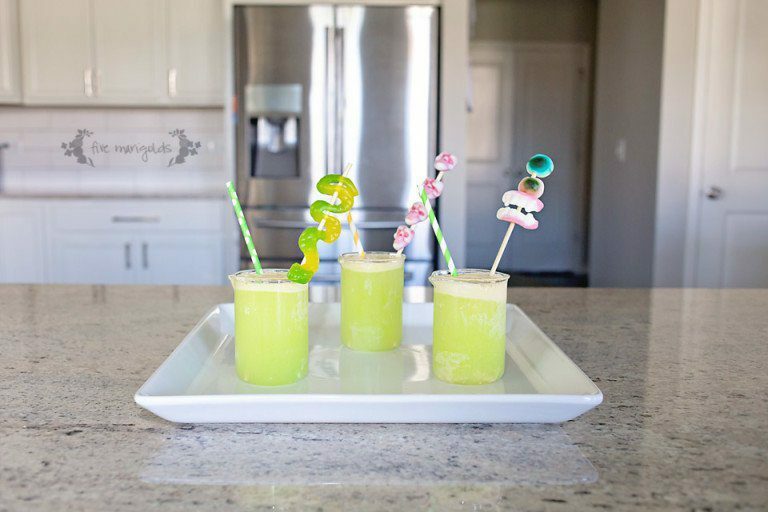 Mean, Green Halloween Punch with Spooky Skewers This refreshing punch with fun and spooky drink stirrers is sure to please at your Halloween gathering! 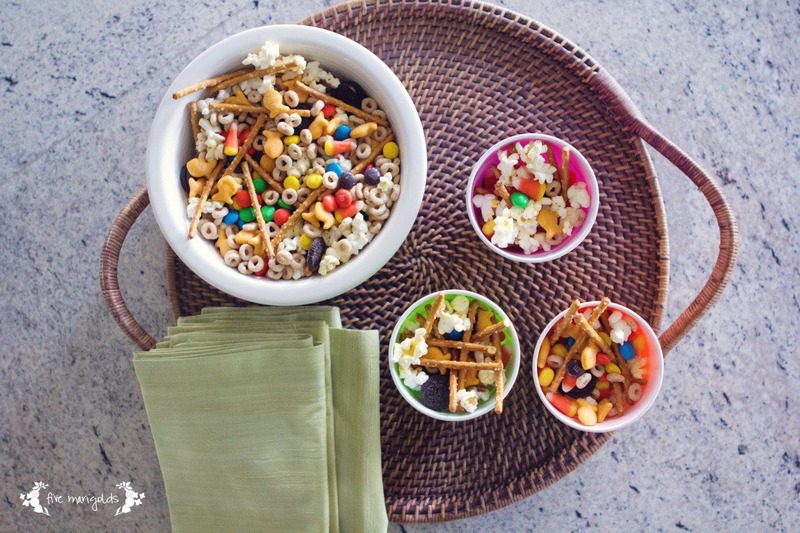 Monster Mix Simply toss whatever you have on hand: I use popcorn, pretzel sticks, Cheerio’s, M&M’s, candy corn, and a few mini Oreos. Just a little effort goes a long way with this snack. I once brought it to a cross country meet in a ziplock with some plastic cups for serving, and I don’t want to brag here – but phrases like “awesome mom” and “best cook ever” got thrown around by my kids and their friends quite a bit. No need to tell them this took all of 2 minutes to pull together. Frankenstein Pudding This one is as easy as mixing a few drops of green food coloring in your vanilla cook & serve pudding and crumbling some Oreos on top. 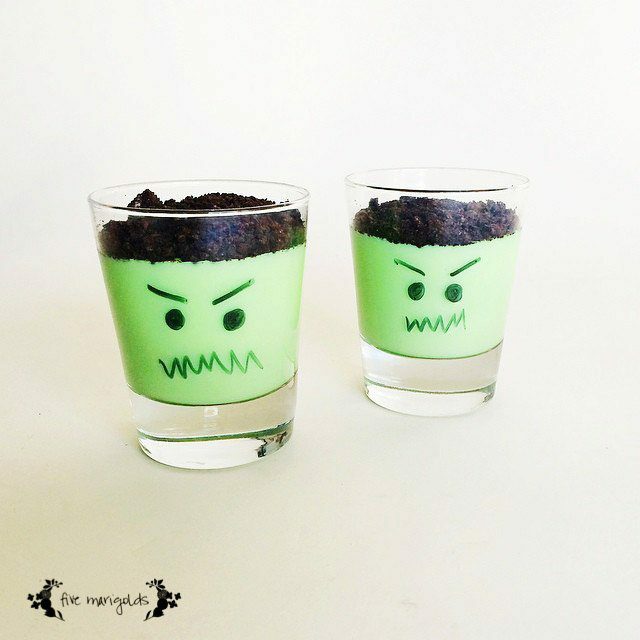 Draw a Frankenstein face on the outside of your clear container with a dry erase marker. 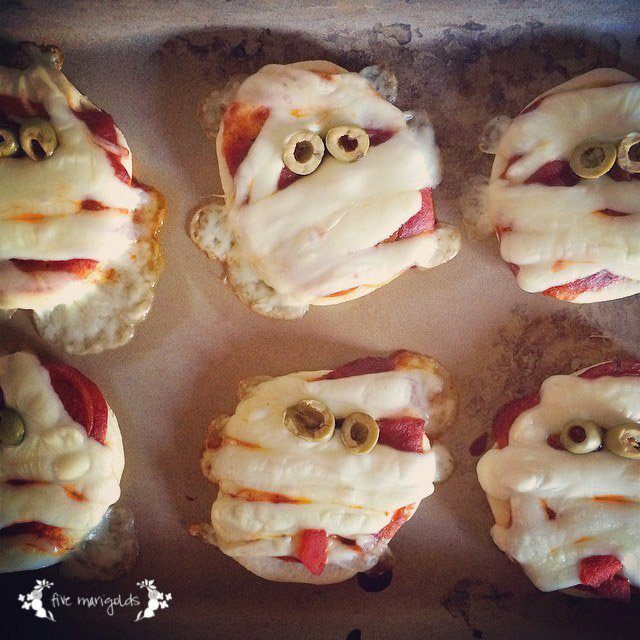 Mummy Pizzas and Hot Dogs It doesn’t get any easier than wrapping strips of crescent rolls around a hot dog and baking them, or DIY mini pizzas using string cheese for the mummy wraps, but it still gets me some serious street cred with the littles. 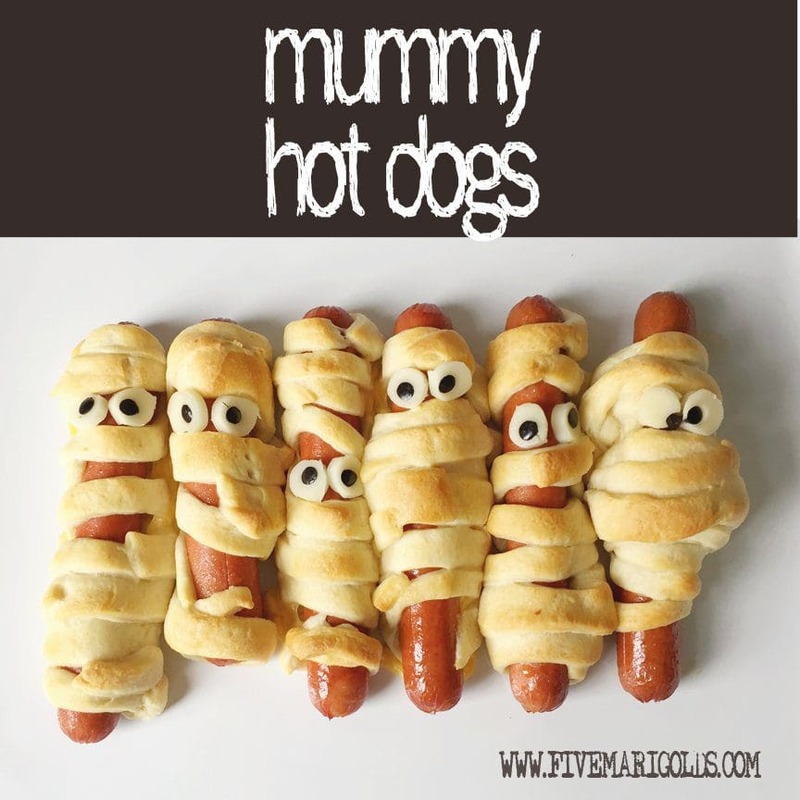 I made the eyeballs for the Mummy Hot Dogs using slices of string cheese and cutting out a hole using a straw. Then, using the same straw to place a perfectly sized olive slice in the hole. I really did that. Should I be ashamed right now? 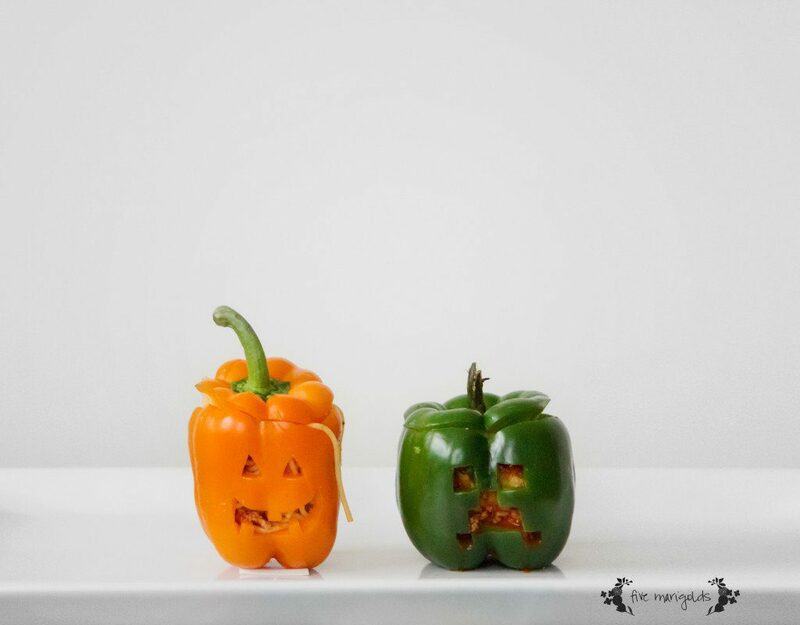 Jack-O-Lantern (and Minecraft Creeper) Stuffed peppers are a regular meal on our rotation, so we love to make it a little more festive in October. We sometimes also stuff them with spaghetti when we’re trying to make our monsters a little more gory with guts. 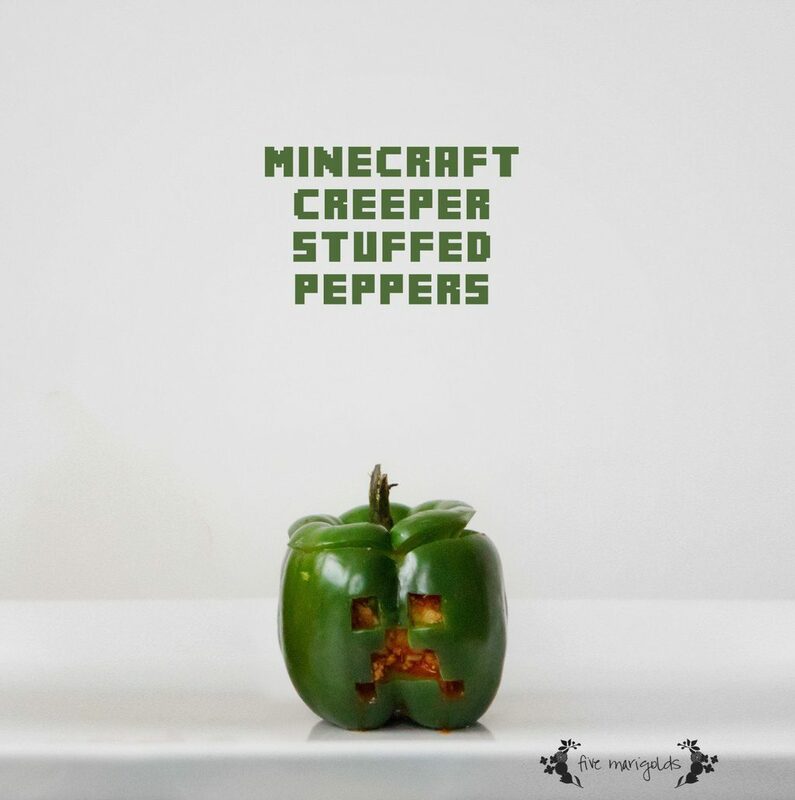 This year, I even made a Creeper Stuffed Pepper for my Minecraft – obsessed son! Candy Corn Jell-O Parfaits These are as easy as they look. Layer orange Jell-O over cooled, firm lemon Jell-O gelatin. 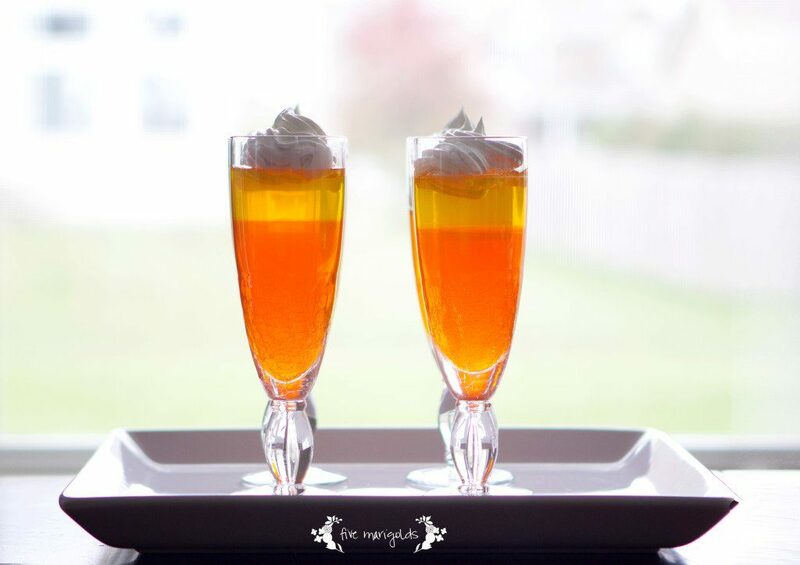 Top with whipped cream and serve! 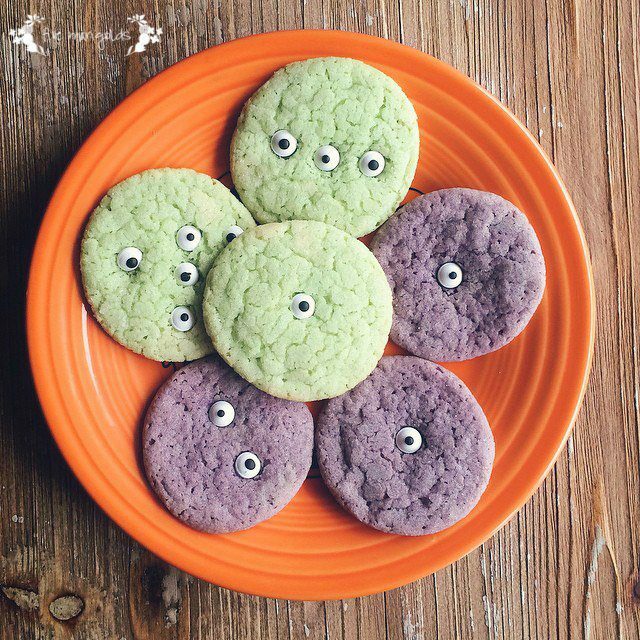 Monster Cookies First, get these fun Wilton eyeball candies and then follow this recipe. 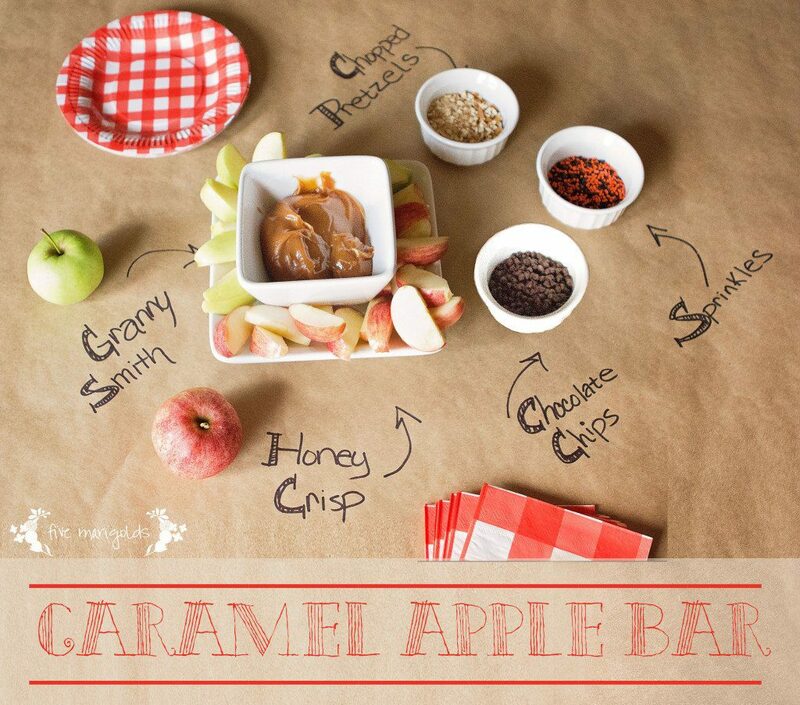 Caramel Apple Bar Okay this one isn’t Halloween, per say, but what a perfect treat for a Halloween Costume party or Autumn gathering? Learn more about how I pulled this together, here. 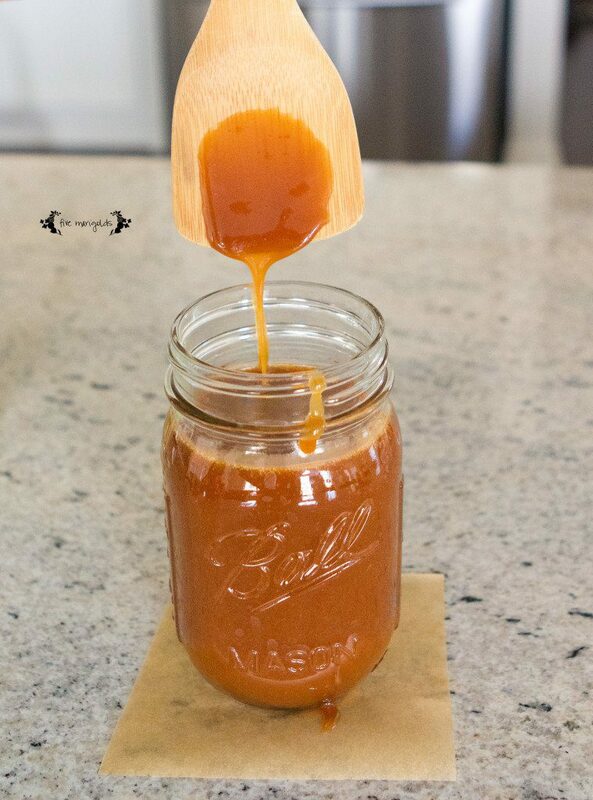 Even better, make your own to-die-for salted caramel dip! The highlight of the goodie bags was a Lego Steve creation I made with the help of Pinterest and the Lego Pick-A-Brick tool. *This post contains affiliate links. Please read the full disclaimer on the right sidebar. Thank you for your support! 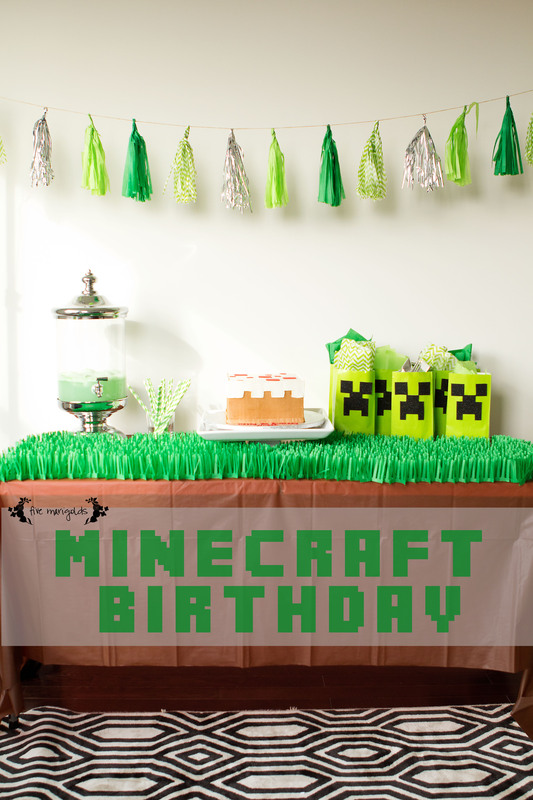 Is your little one obsessed with Minecraft? I feel you. Dub has the game, the app and the collection of hardcover books that he studies relentlessly. 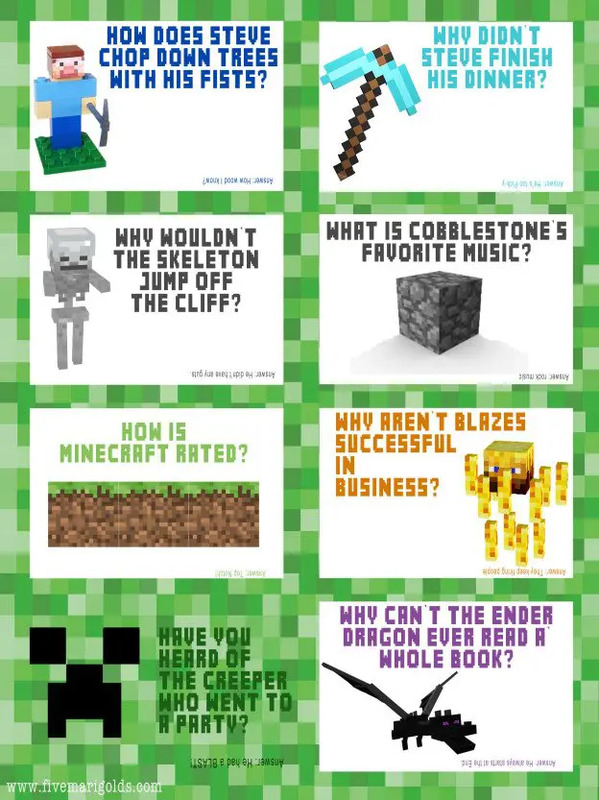 It’s Minecraft hysteria up in here. 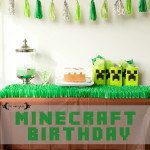 I knew I had to make his Valentine Minecraft-themed. I just wasn’t finding the right thing, so I had to create it myself. 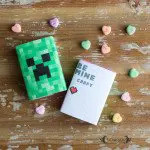 I was most inspired by this adorable candy wrap by Simple as That, but really didn’t want to buy a full box of Mike & Ike candy for each of his classmates *cough*cheap*cough* and I was too lazy to cut out those adorable tags of hers. I know, this says a lot about me. So I went to work creating a wrap for a standard box of conversation hearts. Once it’s printed, I helped cut out the wraps, and then I put Dub to work wrapping the box, using stick glue to seal it on the side, and he signs the back. Done (I love when a good plan comes together). Want to use these for yourself? Download the free printable here. 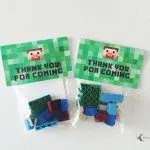 What do you think of these Be Minecraft Valentines? Tell me about it below – I love your feedback!